On Palm Sunday at St. James the Just, during Communion at the English service, I introduced the congrgation to Taize music. “Do you know ‘Jesus, Remember Me? '” I asked. Most shook their heads no, so I sang that beautiful and haunting piece, the quotation from the thief who was crucified next to Jesus, one time through. By the second time through, the congregation, many of them first-time visitors, mostly aid and relief workers, had picked up the hymn. By the third time through, as Pere David Cesar, the priest in charge, and I distributed the bread and wine, the congregation had figured out how to harmonize. 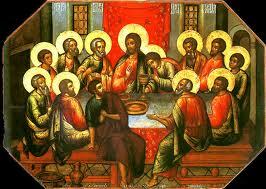 They sang softly and beautifully as they recieved the body and blood of Christ, making that holy meal even holier. Tonight, Pere David and I broke bread together again, this time at a local hotel. Pere David, who is director of the Holy Trinity Music School and the Holy Trinity Philharmonic Orchestra, is a faith-filled man who glorifies God especially through his music. He is an accomplished musician, teacher, and priest. When the earthquake struck, he was in his office, and helped lead several people to safety as the building collapsed around, over and under them. At some point, Pere David and I talked about using Taize again at our Maundy Thursday service tomorrow evening. He instantly translated the chant into French, and we decided to introduce Taize into other services as well. Then, as I described the Taize community to my friend, and how it is a healing place for people from all over the world – and how I hope to go there one day – we began to dream of using a form of Taize to help Haiti heal from its wounds. We dreamed of building a labyrinth, with a garden and trees and the brilliant flora of Haiti, with a small waterfall, and of teaching people healing songs and chants at this new place of which we dreamed. Haiti needs healing. It needs rebuilding. In the new creation that already is taking place here, we dreamed, for a few hours, of how to not only renew the land but renew the people. The people here already are devoted to and dependent on God. God is alive and well and at the center of most people’s lives, especially in these dark hours. Music is an important aspect of their lives as well. Perhaps, we thought as we broke bread and shared dreams, we could take the most important part of people’s lives – God and music and prayer – and bring them together in a new way, to help us heal even more. One thing we do not have to dream about: Jesus does remember us in Haiti. Coming back to Haiti once again, I can already see some of the changes that are taking place. More rubble is being removed, more streets are open, more people are out on those streets trying to reconstruct their lives. But I can also see what is NOT changing: Collapsed buildings still predominate, some with the bodies of our people entombed forever. The Tent Cities are still here, and with the rains now upon us, and still very little sanitation, the risk for disease is increasing constantly. Our children are not yet back in school, because it’s too dangerous. There is still not enough food, or clean water. Lord knows people are trying — the churches, aid organizations, the government — but it’s not enough. And after a while, “not enough” is simply hard to understand, hard to see, hard to live with. Our Palm Sunday services at St. James the Just were beautiful. We had many visitors at our English service this morning, from all over the world. Despite the lack of a bulletin — the printer isn’t working, alas — we still managed to do the service with holiness, especially when we sang together. Some of our first-timers have gorgeous voices, and the harmonies were marvelous. I preached, using a line from my friend Meredith’s sermon: “No more of this!” That’s what Jesus said when one of his disciples cut off a servant’s ear in a misguided effort to defend Jesus. I wasn’t slated to preach, and found out only about two minutes before the service. But my friend’s sermon, especially that focus on “No more of this!” kept ringing in my head and heart. So I preached about what Bishop Duracin keeps saying: This is our new creation here in Haiti. No more of the old ways of doing things! No more going hungry because we don’t have enough food, or money to buy it. No more dirty water to drink, because the water system doesn’t work. No more premature deaths because of a lack of medicine! Jesus didn’t die to leave us in the same old life, I said. He died to give us new life — so no more of this! Since so many of our visitors are aid workers, who have moved far from their homes to come help Haiti, I told them that this was their new life, too: That that is the purpose of Holy Week and Good Friday and Easter itself. No more, I shouted! And then some of the same old life crept right back in. This afternoon, at St. Vincent de Paul Catholic Church up the mountain, the Ste. Trinite Philharmonic Orchestra gave a Requiem Concert for the members of the Music School and Orchestra, and friends of both, who died in the earthquake. One of my colleagues, the Rev. Randall Chabot-Stahls, who helps lead the English service at Ste. Trinite, was sitting next to me when he discovered the name of one of his friends who had died on Jan. 12. Randall had been trying to reach his friend, but hadn’t gotten through. His tears lent a special poignancy to an already poignant service. I, too, discovered the name of one more person whom I had not seen, but for whom I held out hope. Such is life in Haiti now. You keep hoping that people from whom you have not heard have simply lost their phones and don’t know your number. You keep hoping to hear good news. But then the same old kicks in, and you find out the bad news, and you have to figure out how to go forward, how to mourn, how to tell your story and then live with it. It is only the hope we have in the Resurrection that keeps people going here … there’s nothing else but that hope. And that’s what the concert gave so many of us today, hope. Hundreds attended, and all of us drew strength from the beautiful music, from hearing the Orchestra perform and the Petits Chanteurs sing. We listened to Faure and Bach, to De Lalande and Mozart, to Dickens Princivil’s soaring “Transitions.” We listened and wept and smiled and applauded and in the end realized: No more of the old ways! We have new life, and that new life will sustain us, despite all the difficulties that we still face in Haiti. As we move through Holy Week in this hard place, we are holding on to the hope that we have in Christ, the hope of the new life that we face, and that we have. As long as we keep that hope in front of us, we can say, with all the power of our lives, No more! I ask your continued prayers for the people of this place, so that we can draw strength from your strength.